We can't help ourselves, Pixar knows how to make everyone relate to their characters, whether they're toys, fish, robots or (in this case) superheroes. Photo: Dave Vollmer. During these weeks leading up to the release of Brave , we GeekMoms have been happily discussing our favorite Pixar films, our favorite characters, and our favorite storylines. Also, we’ve been sharing memories of our first Pixar films and our first experiences with taking our kids to Pixar films on the big screen. 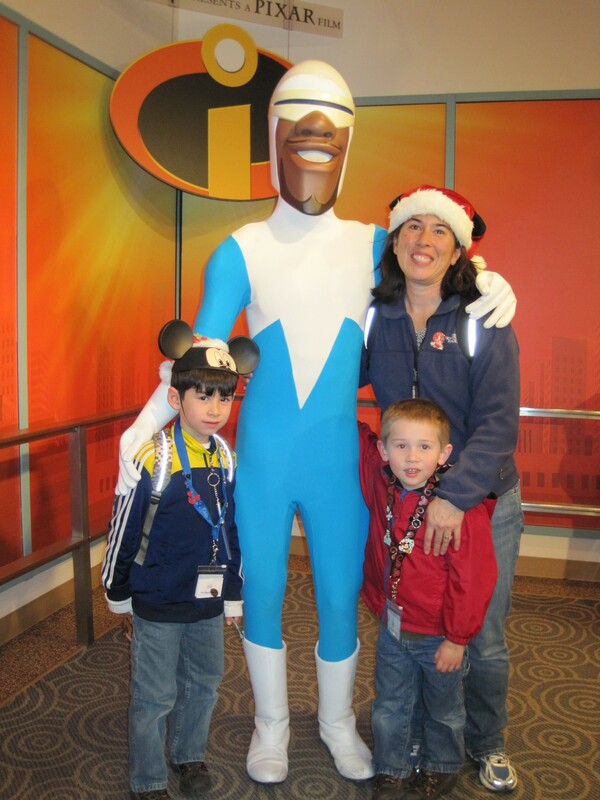 Which leads to the question: Why do we GeekMoms love Pixar so much? Why aren’t we this excited over, say, Madagascar 3 ? Because the Pixar directors, writers and artists are GEEKY! That’s why! And by “geek” I mean the pop culture definition of the word: someone with an above-the-standard level of knowledge about a topic. The Venn diagram shown here says it best. When Pixar decides on a story, they go big or go home. We all understand the level of detail their animation has. We also all understand the incredible storytelling that goes on. But the thing I love the most is the research efforts the studio puts into the story and the animation. They’re trying to tell stories from very unusual perspectives and they spare no expense ensuring the perspective is scientifically accurate. Many of the Disney DVDs and Blu-Rays include documentaries about the research trips and classes that the writers, artists, and directors offer to those involved in making the films. We enjoy those as much as we do the feature films and the shorts. I offer you this list of examples of research efforts in their films. Hey Pixar, do you need a meteorologist? To do research for A Bug’s Life , Pixar crafted a tiny robotic camera on Lego wheels to drive around the Pixar campus. This “Bug-Cam” provided insight to how large the tiny things in a human world would look to a bug. Most Pixar geeks know that Monsters, Inc. perfected the CGI-development of fur. This video provides insight to how much work it took to perfect Sully’s fur. We really enjoyed the scenes of Sully in the obstacle course. For Finding Nemo , University of California Irvine Ecology and Evolution professor Adam Summers was brought to the Pixar campus to give what he called “an essentially graduate-level ichthyology course…”. He helped work with the artists to strike a balance between real fish muscle movements and the movements that were be required to make Marlin, Nemo and Dory talk. Learn more about Finding Nemo’s research here. The Incredibles was Pixar’s first feature film with human protagonists, complete with their hair, clothing and mannerisms. This video discusses the challenges they faced with the sets, attempting to establish a time setting that left everyone wondering, while having to program water, fire, jungles, home life, cubicle life and world-destruction life. For Up , the crew took a “field trip” to Venezuela to visit the real Paradise Falls! And I’ll leave you with Ratatouille . A lesser-known Pixar film that I happen to love because of my passion for cooking. Crew members spent time in Paris learning the geography and culinary culture in which they’d be telling the story. But many challenges faced them, such as animating Paris’s sewer system — and a bunch of rats swimming and rowing in it! The Pixar artists tackled CGI-rendering of gourmet food in painstaking detail, taking cooking and food presentation classes from a Pixar set designer who also had formal culinary training, as well as with internships in San Francisco’s finest restaurants. Learn more about Ratatouille’s research on Wikipedia. ← EPCOT’s Brave Highland Games Tournament Play Area: For a Limited Time!